Faith Baptist Church is a group of people committed to Jesus and to one another. Our church family includes businessmen and factory workers, teachers and students, homemakers and retirees, men and women, boys and girls all united under Jesus. Our Core values, mission statement, and beliefs reveal the foundation upon which the entire church is built. 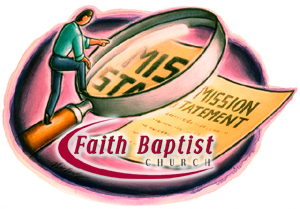 The Faith Baptist Church Mission Statement is a simple, concise declaration of what we are all about. Following Christ may be simple, but it is never easy. Jesus said, “Whosoever will come after me, let him deny himself, and take up his cross, and follow me” (Mark 8:34). To follow Jesus always means a cross. 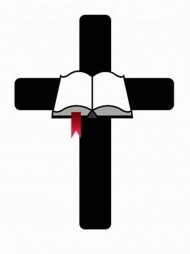 The cross is our symbol of the characteristics of a fully-functioning follower of Christ. We believe people were created in the image of God. Through Adam all people obtained a sin nature which produces sin. Because of sin, all people in their natural condition are separated from God and are under the wrath and condemnation of God. Since God created mankind into genders distinctly male and female, we believe that the only legitimate marriage is that between a man and a woman. He has commanded that no intimate sexual activity be engaged in outside of marriage. We believe that God disapproves and forbids any attempt to alter one’s gender by surgery or appearance. (Gen. 1:26; 2:24; 19:5,13; 26:8-9; Lev. 18:1-30; Isaiah 59:2; Rom. 1:26-29; 3:23; 7:2; 1 Cor. 5:1; 6:9; 7:1; Eph. 5:22-23; I Thess. 4:1-8; Heb. 13:4).